Hi my lovely friends! We are half way through Ramadan; I cant believe how quick the time has flown. Eid is just 2 weeks away! 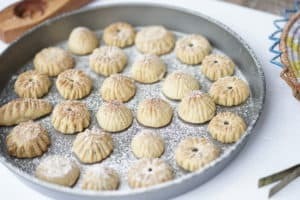 I knew I had to get my mama’s maamoul (Eid cookies) recipe out to you guys just in time to make for our beloved holiday. 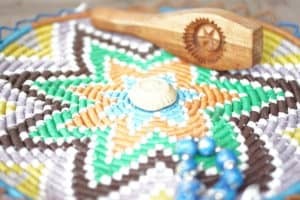 There are MANY variations to making this cookie. Some recipes call for semolina flour; some for both flour and semolina but this one is just flour. There are several ingredients that may have you asking what in the world is that? Don’t worry, you can find them all at your local Arabic store for sure. They add great flavor and a hint of color to your delicious date cookies. You can also find the decorative cookie spoons there too! 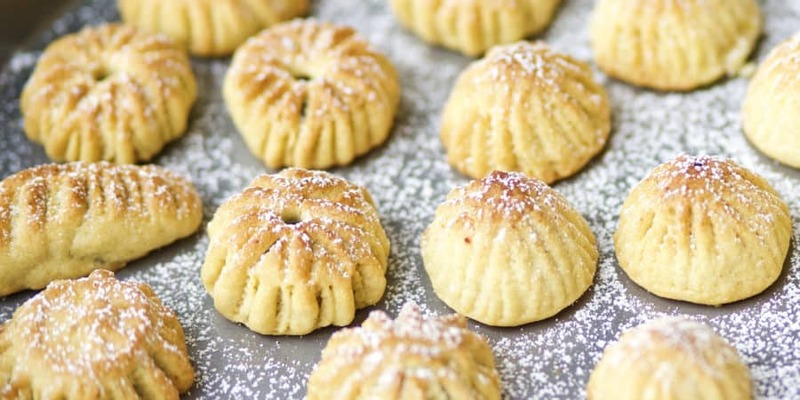 I have got to say that these cookies are my absolute favorite especially with the dates filling. You can do the same cookies but filled with nuts too. Even though, I am gluten and dairy intolerant; I find myself reaching for these because they are that addicting. I keep telling myself every now and then one won’t hurt! 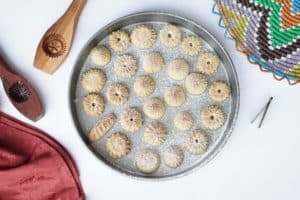 Now that I am married and no longer live at home, I wanted to create similar memories for hubby and I’s Eid by making these yummy melt in your mouth cookies and serving it to all our friends and family like we did growing up. I hope you give this recipe a try and do the same! I also have a video below of how I make them to make it easier for you to visualize. In a large bowl, add all the dough ingredients except the water. Gently start mixing with your hands almost rubbing the ingredients together between your palms rather than kneading the dough. Add the water a 1/4 cup at a time till fully incorporated while still doing the same hand movements. Make sure ingredients are well combined. Keep dough covered in plastic wrap so it doesn’t dry out. Next, grab another bowl and mix together all the date filling ingredients with your hands as well. Form small date balls almost 1 tbsp in size with this paste. Grab about a tbsp of the dough and shape it into what looks like a mini bowl in the palm of your hands. Insert the date ball in the center of it and wrap the dough around the date ball to completely cover it. Place this into the cookie spoon mold nicely. Tap the mold till the cookie releases. (I usually tap it on the edge of a hard surface). * To prevent dough from drying, cover it lightly with plastic wrap while you are working. Place the cookies onto a baking sheet and bake for 15-20 minutes until lightly browned on the bottom. Then broil them for 2-3 minutes till golden brown on top. Keep an eye on them! Once out, allow them to cool then sprinkle with powdered sugar. Hi, this recipe is interesting. I’ve never seen mamoul made without smead. Hi 🙂 it exists! There are recipes that just strictly use smead then some that use both. This one is just flour and it still melts in your mouth. Hello! Thanks for the recipe! Hoping to try this tomorrow. I cannot find the misk anywhere-is this optional? Hi! So, I recommend adding the Mastic because it gives a subtle nice flavor but it isn’t a must. It definitely adds a nice flavor though. I found mine at a local Arabic store just ask for mastic or Greek mastic or if you are in a cultural section in a supermarket maybe. They look like crystals! You have to smash them yourself for the cookies 🙂 hope this helps! Hi…i always wanted to try a recipe with flour. Why doesn’t this recipe call for baking powder or yeast?? Hi! It simply isn’t needed with this flour recipe; you mainly see that being used in semolina based maamoul.